Refurbished in 2018, newly decorated and with new carpets throughout, this fantastic ground floor flat has a sunny outlook; the double bedroom has a double bed (120cm), a wardrobe & bedside chest. The kitchen/living room has a large Ikea sofa, a dining table & chairs, a large desk and digital TV aerial connection. The fitted kitchen has an electric fan oven/grill & gas hob, microwave oven, fridge/freezer, sink/drainer & washer/dryer. 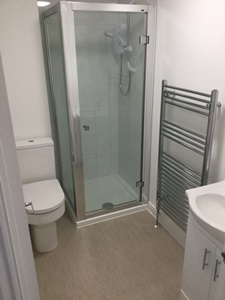 The shower room was refitted in 2018 and has a new shower with glass door (electric shower), a new WC & new vanity unit/washbasin. Outside there's a small paved area with washing lines & patio chairs. This flat is available for rent either by a couple or just one student. We do not charge extra rent for occupation by a couple. 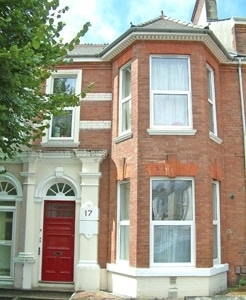 The rent for the flat is £150/week and the deposit £600 whether let to one or two students. (So for two sharing the deposit is £300 each and the rent is just £75/week each). Please note that although the rent at this 1-bed flat includes WiFi, the water, gas and electricity charges are not included. Plymouth University recommend that you budget £8 - £10 per week to cover these bills. The tenancy at this student flat for academic year 2019/20 is for 52 weeks, starting 01-Sep-2019 and ending 29-Aug-2020.